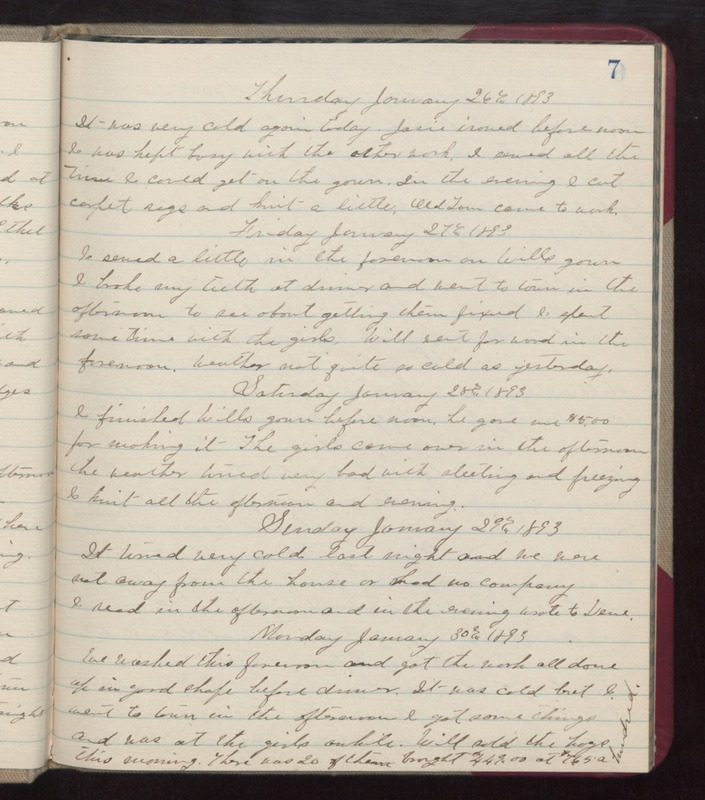 Thursday January 26th 1893 It was very cold again today. Josie ironed before noon & was kept busy with the other work. I sewed all the time I could get on the gown. In the evening I cut carpet rags and knit a little, Old Tom came to work. Friday January 27th 1893 I sewed a little in the forenoon on Wills gown I broke my teeth at dinner and went to town in the afternoon to see about getting them fixed and spent some time with the girls. Will went for wood in the afternoon. Weather not quite so cold as yesterday. Saturday January 28th 1893 I finished Wills gown before noon. He gave me $5.00 for making it - The girls came over in the afternoon the weather turned very bad with sleeting and freezing I knit all the afternoon and evening. Sunday January 29th 1893 It turned very cold last night and we were not away from the house or had no company. I read in the afternoon and in the evening wrote to Vene. Monday January 30th 1893 We washed this forenoon and got the work all done up in good shape before dinner. It was cold but I went to town in the afternoon I got some things and was at the girls awhile. Will sold the hogs this evening. There was 20 of them brought $449.00 at $7.65 a hundred.